Kemper Boyd—suave FBI Agent infiltrating car theft rings. His best friend, Ward Littel, also an FBI agent, but a bored one stuck in Chicago. Pete Bondurant: a six-foot-five fixer for various underworld figures, including getting drugs for Howard Hughes. Hoffa and the very real mafia. Best of all, Boyd, Littel, and Bondurant team up with the mafia, militant Cubans, and KKK members to set up Bay of Pigs, then after JFK calls off the second airstrike, anti-Kennedy vitriol explodes in the criminal underworld. “American Tabloid” is seamless. Boyd and Jack are both rather oversexed. Littel had an apostasy about RFK, and went from huge fan to mortal enemy. Along the way, “Tabloid” provides vivid crimes, drug importing, covert CIA murders, true icepick through the eyeball stuff. It’s the kind of book that will make you want to take a really long shower after you read it, and immature or queasy readers should pick something else. But this grim, grimy ride is probably my second or third favorite book ever, and I’ve read it at least ten times. I’ve taken a lot of showers. 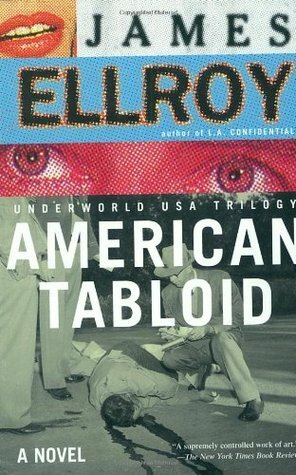 This entry was posted in Books, Books Read in 2014, General Fiction, Literary or Genre Fiction, Mysteries/Thrillers, series and tagged American Tabloid, booksandmoviesandcrap.com, James Ellroy. Bookmark the permalink.